FCE Scan® - Back scan, Pelvis scan And Hip scan. We scan from the lower neck, down through the spine and into the pelvis. We provide both 3D and 4D (movement) scans of the spine & pelvis. 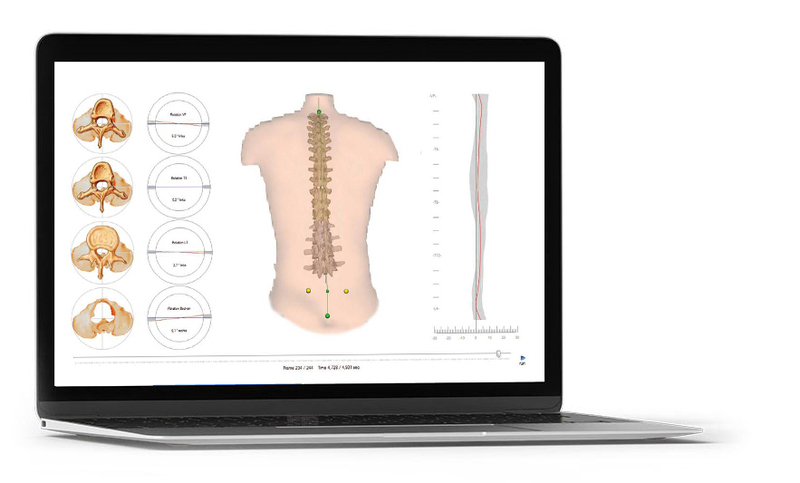 Our static scan provides information on posture, weight bearing, sway patterns and objective detailed analysis of spinal and pelvic positions. and where strain patterns are occurring to create or predispose injury. We are the only company in Ireland with the ability to perform such detailed analysis. know what is happening and why. We offer Free care plans going forward. We also have a directory of therapists we can refer you to if necessary. “The best scan I have ever had, can’t recommend this enough.” – Barbara. “My scan has changed my life….feeling so much better with the right diagnosis.”– Sarah. FCE Scan provides an in depth postural analysis. In addition, the back scan involves a 3D image scan of the spine while also measuring the force of weight-bearing on the feet. Posture has a large bearing on injury occurrence or predisposition to injury. Poor posture has an effect on general health and has an influence on the function of our respiratory, cardiovascular and digestive systems. In the case of arthritic posture or in osteoporotic patients it is especially relevant to have a reference point for your posture. FCE Scan uses its back scan and pelvic scans to gauge improvement to treatment. By knowing your posture type you discover areas of your posture that need improvement. FCE Scan’s system has the ability to examine a clients Back, Pelvis, Legs, and Feet both statically and in motion. The motion factor is the unique element. Most injuries occur whilst in motion. However, almost all forms of therapy assess injuries from a static point of view. Consequently this can lead to misdiagnosis, an unreliable treatment plan and a high likelihood of injury recurrence.